Kansas City, Mo. — The flyweight division continues to expand as Invicta Fighting Championships has signed another 125-pound fighter. Sharon Jacobson is the newest athlete to sign with the promotion. The 31-year-old is a former U.S. Nationals wrestling champion and Army Combatives veteran. She will enter the promotion on the heels of a dominant, 44-second TKO win in July. A California native that attended Valhalla High School, Jacobson moved to Colorado Springs, Colo., in pursuit of Olympic glory. Her desire for competition led the wrestling stalwart to mixed martial arts. 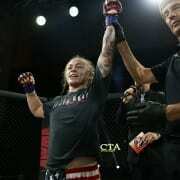 In her two-fight professional career she has competed against the likes of current Invicta contender DeAnna Bennett. “I’ve been waiting for this for a long time,” said Jacobson. “I’m proud to be a part of Invicta. It’s a good milestone for me. Jacobson is expected to make her Invicta debut in early 2015.